"Tell all the Truth but tell it slant – Success in Circuit lies…" Emily Dickinson, Poem 1129 in her Complete Poems. Kim Campbell on Brentwood Float? CVA 2008-022.175 – Grey Cup Parade, on Georgia and Howe, Brentwood Towne Centre float. Early 1960s. Leslie F. Sheraton photo. 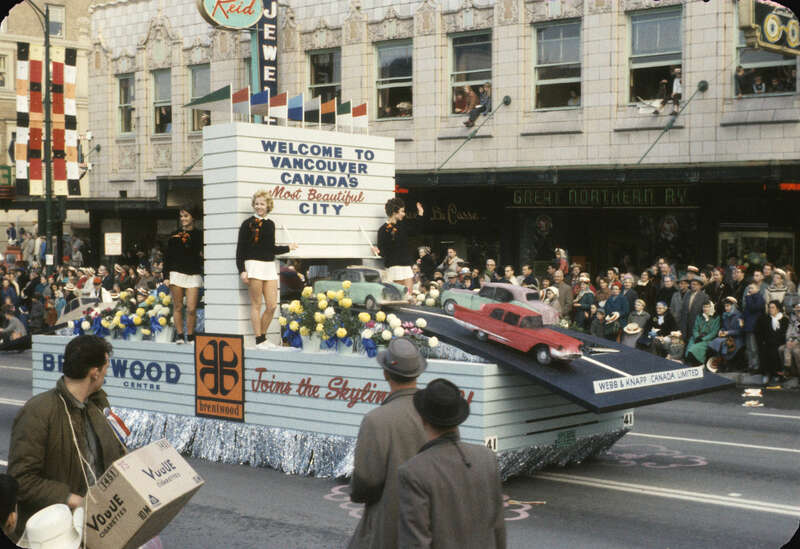 Could the blonde young woman on this float advertising Brentwood Towne Centre shortly after its opening in the early 1960s be Canada’s 19th Prime Minister, Kim Campbell? I think her age would be roughly right (she was born in 1947), and the resemblance is certainly remarkable. Perhaps one of her friends or she herself would care to comment as to whether this is an image of an early Kim? If you are interested in some of the history of Brentwood, this is a good place to start. This entry was posted in L. F. Sheraton, parades and tagged 1960s, bc, Brentwood Towne Centre, burnaby, Grey Cup Parade, history, Kim Campbell, vancouver. Bookmark the permalink. 3 Responses to Kim Campbell on Brentwood Float? I tweeted this to @AKimCampbell. I worked for her years ago. We shall see if she / her twitter person responds. A resemblance perhaps, but I don’t think its her. Good fun though. B.C. Lions SNORED in ’54! Where Was This Photo Made? Not ‘Cricket’ (Nor True to the Story)! Bridge Tender’s Nightmare Made Worse? HNY from BC Electric (and VAIW)! Maple Leaf Flying in Vancouver Nearly 40 Years Before Becoming National Flag! J. W. Freeston and a California Shoe Company Outing? ‘Zip Line’ to Wreck Beach for Construction of Early UBC Buildings? First Baptist Church in Disguise? Pet/Person Fountain . . . Gone. Lads and Strays BENEATH the Platform, Please! Pacific Centre Rotunda to be Demolished for Denser Commercial Space? REALLY? T. T. Shields ‘Second Fiddle’ to A. E. Greenlaw… Who?